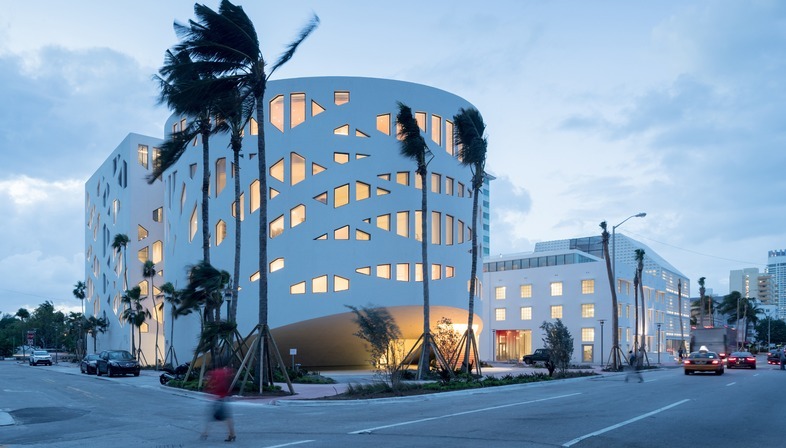 The Faena Forum is a building with a reinforced concrete façade which is given an easily recognisable character even without illuminated signage thanks to its unusual interwoven catenary curves. 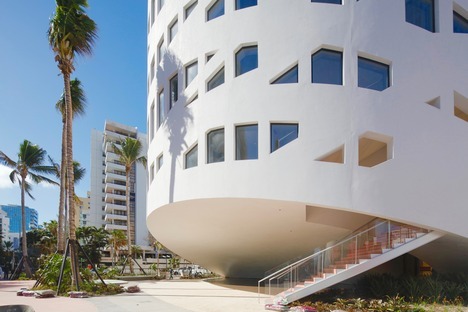 The building is part of the Faena District, which includes three constructions in Miami Beach on a site between Indian Creek and the Atlantic Ocean. All the buildings are constructed using ordinary modern concrete construction techniques with a contemporary new look. 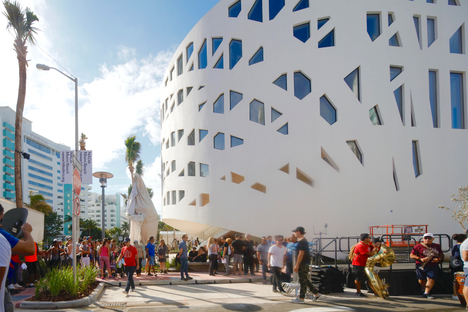 One of the three buildings, the Faena Forum, contains a number of flexible spaces designed to host a great variety of social events, from pop culinary events to traditional art exhibitions and innovative new cultural events. The architects have created a building composed of a cylinder and a cube of similar size, in which the entrance is distinguished by a big cantilever topped by a circular volume. This structural prodigy is made possible by a static scheme created by having the façade collaborate with the building’s whole inner frame, making the 46 foot overhang (about 14.00 metres) child’s play. And that’s not all. The architects did not simply stretch structures from above and construct a reinforced concrete frame canopy with straight elements, but created a vast grid of catenary arches that float freely all along the façade. These in turn are intertwined with vertical elements to create a solid structure allowing them to achieve their original structural ambitions almost effortlessly. And if it should seem like a lot, the 50cm of thickness of the façade looks very thin in the final effect, as the repetition of formal features reveals to the onlooker the brilliant, fresh, dynamic architectural design, with 350 windows dotting the two volumes and creating a simple but high-impact spectacle at night.